“You & Me: Our Relationship” is Nikhil Mukhija’s first novel. To be honest, the first time I heard the name of this one, I thought to myself “Oh no! Not another college love story.” But then, when I turned to look at the back cover, I was surprised to read that this one is a non – fiction / self – help book. So does it work? Let’s check it out. – Those who are missing the charm in their relationship. Offering an insight into Love, Crush and Infatuation and with psychology assisting you. 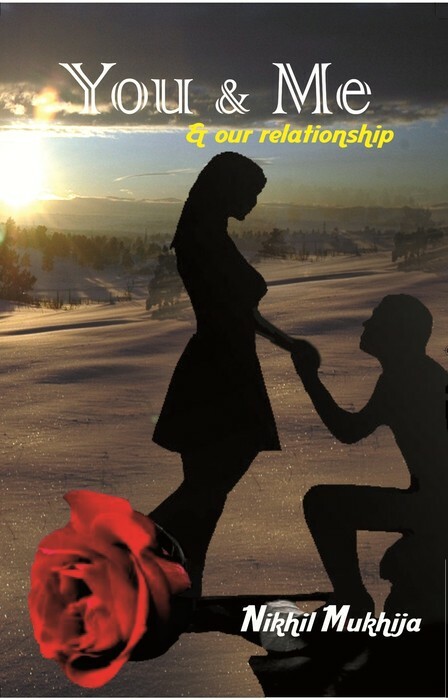 This book gives you an insight into how a person perceives love and what causes attraction between a girl and a guy. Love is a very delicate feeling and even a slight mistake can lead to misinterpretation and misunderstandings. So its better to read this book and be forearmed with the arsenal to shoot down any adversity that comes the way of your love life. In the era where packing matters more than the substance itself. It is neither a fictional story nor a hypothesis. It is a theory that will rewrite the script of your love life forever. Love stories are commonplace in the contemporary Indian literary scenario. But Nikhil has tackled the concept of love in an altogether different way. So many of us are confused on how to approach a girl, what to tell her if we happen to love her, how to understand girl psychology and what not. Nikhil tries to provide answers to all this and more through the way of his book. Through different examples, he has tried to answer each and every problem a guy faces in approaching a girl. A lot of his understanding seems through experience while the rest maybe from talking to friends and their likes. Each chapter of the book needs to be read separately and slowly. Obviously its not exactly like a novel wherein you read each chapter continuously and try to finish it as soon as possible. Instead, one can read the chapter which catches one’s attention first. And in this aspect, Nikhil has done pretty well. I am sure there will be many who may have been lost, troubled, confused or even heartbroken in love who may find the book pretty helpful and unique. But then, the book has a lot of problems. The title of the book gives out a feeling that its your everyday college love story. And to people like me who are bored of such crap in the name of writing, we wouldn’t really take the effort to check out this one. Even the cover design with the generally dull colours is pretty unattractive. I have always felt that however good your content is, the cover page and the design should be attractive enough for anyone to pick it up and read through. And this one isn’t good enough on that count. Nikhil has written the book in a very conversational tone. It’s like as if he was talking to his friends or addressing the many youngsters out there. Good enough. Point taken. As a friend, such a tone is ok, but for a writer this shouldn’t be the way to drive home ones point. Yes, he may have been trying to associate with his audience. But he surely could have done better. The interspersed Hindi at places with sudden changes of paragraph and use of bullet points hinder the flow quite a bit. And then, there are also quite a few grammatical and spelling mistakes which take down the reading experience by several notches. All in all, its a good thought gone awry. Nikhil, you could have done way better than this. Non – fiction self help books really have a genre of their own. They are really good in their sweet own ways. But then writing such a book requires tact, courage and some style. Sadly “You & Me: Our relationship” was missing all this. Shall checking out this book you suggested. Looks interesting :). I completely agree! I have learned so much from “Get Real! Fighting The Mythic Woman Finding Your Authentic Self”. I know you will enjoy it! Now I am waiting to read it soon for sure :). Yeah Donny, self help is truly an amazing genre in books and articles. I am sure a lot of people do get benefited from it.